Here I will link all blog posts related to Windows 10 troubleshooting issued, that I’ve postet. 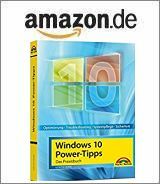 A 2nd ressource is my German Windows 10 Wiki/FAQ – that contains far more articles – especially about Windows 10 upgrade issues. Also the english Wiki How to: Troubleshoot common Setup and Stop Errors during Windows 10 Installation (extended German edition here) from my MVP collegue Andre da Costa may be helpful. Windows 10: What are dynamic updates? In case of issues, I recommend, to run a system check like it is discussed below and in KB947821.